BRIAN Molefe, the returning CEO of Eskom and the power utility’s chairman, Ben Ngubane, allegedly pressed former mines minister, Ngoako Ramatlhodi, into blackmailing Glencore, according to a report by AmaBhugane, published by Eyewitness News. According to the report, which is denied by Eskom, Ngubane asked Ramatlhodi to suspend Glencore’s mining licences and impose a R2.17bn penalty on Glencore’s then mine, Optimum Coal. The penalty was for supplying below specification coal to Hendrina, Eskom’s power station. The aim of this request was ultimately to force Glencore into selling Optimum Coal so that the Gupta family could buy it which, as detailed by the Public Protector’s report, was allegedly part-financed by Eskom. Ramatlhodi told AmaBhungane that he declined Ngubane’s request, but then was later removed from the mines ministry by President Jacob Zuma and replaced by the then little-known Mosebenzi Zwane who had had business dealings with the Guptas in the past. EWN’s full story is available here. 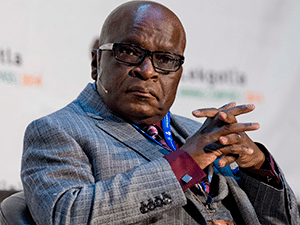 Ngubane later told journalists that the claims made by the report were baseless as it was impossible that he could tell a minister what to do. “We cannot instruct a minister what to do. We take our problems to the ministers, we ask for help when we need help. For him to claim that we actually made him take a decision about something is preposterous,” said Ngubane. He was commenting after an address at the African Utility Week conference in Cape Town. Molefe was due to give a keynote address at the conference but was called away to deal with “urgent matters”. And Zwane wants people to support and trust him??? Zuma’s, Zuptas and Zwane’s must go!! !